The Cliffs of Aquinnah, on Martha's Vineyard, at twilight. Over the years, I’ve written many stories about Martha’s Vineyard, but I recently realized I had been amiss in one important subject: the Wampanoag and their ancient legends. This tale is thus the start of my effort to change that. 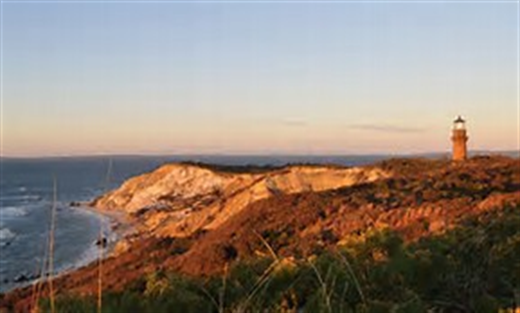 I’ll start with the most famous: the story of how the clay cliffs of Aquinnah got their colors. The cliffs are made of clay. You see, the cliffs, which are massive outcroppings of clay are black, tan, white and red, and are a major tourist attraction for the island. I know that I mentioned this legend, of the Wampanoag, in a previous story, but I never went into detail, never did it justice by giving it a right and proper telling. Well, now I shall! The Wampanoag have lived on the island of Martha’s Vineyard for centuries, perhaps millennia. The mythology is that some of them floated down from Maine or Canada on ice flows during the last ice age. They found the island a pleasant place to live; rich in fine plants and animals to eat, the waters teeming with fish and whale, and plenty of fine clean water. Roughly, several thousand Wampanoag settled the Vineyard, by the time the Europeans came to New England. Unfortunately, the settlers brought bubonic plague, chicken pox, pneumonic plague, cholera, diphtheria, influenza, measles, scarlet fever, smallpox, typhus, tuberculosis and whooping cough to the new world. The native population was devastated. It had no natural defences to fight these new diseases and their numbers dwindled. The native population of the new world gave the European colonists syphilis, yaws and bejel, among other diseases, in return. The settlers had no natural defences to fight on these related diseases. This was a quid pro quo, of a sort, by the native population. Here’s the myth of the cliffs at Aquinnah. When the first settlers reached Aquinnah, on Martha’s Vineyard, and saw the cliffs, they asked about the colours. The Sachem, the leader, of the tribe told them the story. Moshup was one of their chief gods. He was a giant who lived with his wife, Granny Squannit, in a den at the foot of the cliffs. She was the leader of the magical little people of the island and part of the reason he married her was to help maintain the balance of nature. When he grew hungry, he would wade out into the nearby waters and scoop up a whale or grab a huge stone to hurl at one that might be too far away for him to snag. Carrying the whale back to shore, he’d carve it up, pull up some trees by their roots in order to make a fire to cook it for them. When they finished eating, Moshup would toss the ashes and soot, the bones and blubber, onto the cliffs, and, thus, over the years, the clay acquired their colour. It also explained why the area had virtually no trees. That last detail was always the one that mystified me. After all, one of the things people say about American Indians or the Natives, as the PC term of our day calls for, is they usually live in harmony with nature. It’s we civilized people who screw things up by clean cutting the forests and digging up the countryside. Moshup was a kind and wise ruler. It’s clear, though, he needed a few lessons on re-planting trees. It would have helped with that whole “maintain the balance of nature” thing. The cliffs remain; weather worn and protected by law. Today, the cliffs still stand; albeit not as large as before, wind and rain continue to wear them away. The cliffs are a national treasure. As a boy, I used to climb the cliffs; we always enjoyed tearing off a clump of clay to make a pot or something. These days, you can’t do that anymore. The cliffs need protecting and the natives and islanders put forth a great deal of effort to do so. Not only is climbing forbidden, but there are signs stating that removing clay is a crime. I can understand that, and somehow I think Moshup would agree. This is the first installment, in a four-part series, on the Wampanoag. They are earliest known settlers of Martha’s Vineyard, which, today, is a summer colony for vacationers, off the east coast of Massachusetts. Click here to read installment two. Click here to read installment three. Click here to read installment four.